Are obituary photos an accurate reflection of the deceased? It turns out the answer is not really. Obituary photos have some built-in biases. Find out what they are and how they can affect your genealogy research. An interesting genealogy study from Ohio State University suggests that obituary photos are showing a growing bias against aging faces. The study conducted by Keith Anderson and his graduate student Jina Han examined newspaper obituary photos in Ohio over a thirty year period from 1967 to 1997. What they found was that “age-inaccurate” obituary photos had increased significantly since the 1960s. An age-inaccurate obituary photo was defined by the authors to be one where the deceased was more than 15 years older than the estimated age in the obituary photograph. Interestingly enough, women were more than twice as likely as men to have an obituary photo that was age-inaccurate. Obituary photos are typically chosen by either the spouse or adult children of the deceased. Often obituary photos show the deceased at the peak of their life. The fact that obituary photos are getting younger suggests “we were less accepting of aging in the 1990s than we were back in the 1960s”. The study found that an inaccurate age in obituary photos has steadily risen from 17% of all obituary photos in 1967 to 36% in 1997, as shown in the table below. Furthermore, the researchers found that the odds of having an age-inaccurate photo increased with the age of the deceased. In most societies, prestige comes with age. Growing old was something to be celebrated by the few who were able to achieve such a status. Consider the image below. It is a marble funerary head of a Roman citizen from the First Century B.C. Notice the aged, bony structure, deeply etched wrinkles, tight-lipped mouth and intense frown. The image prominently shows both the age and the personality of the deceased. Showing images of ancestors is a common custom across different cultures. 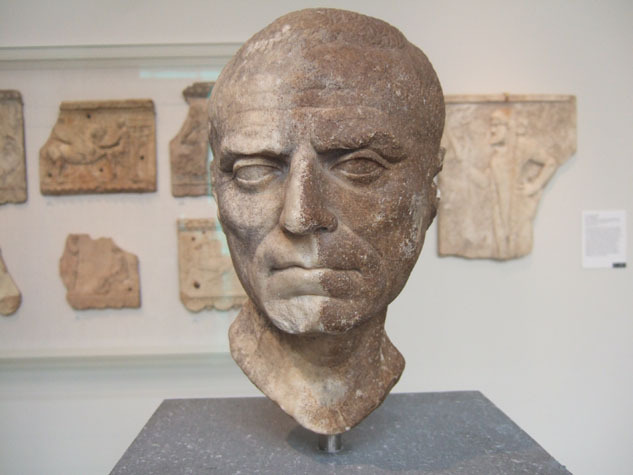 In Roman times, the wealthy made head busts, as shown above. During the Renaissance, the wealthy commissioned portrait paintings. In modern times, the portrait photograph is the preferred means of capturing images of older family members. Although technology has evolved over the millennium from carved marble busts to portrait photographs, the concept of an obituary image is very old. Those cultures that exhibited images of their dead usually did so in a realistic style that accentuated individual features and the effects of age. The study points out that in modern times, people tend to live longer and also tend to have more chronic illnesses (as a result of living longer). As a result, the family may wish to show the deceased as they appeared in younger, healthier times. However, they also point out that this is unlikely to account for all the shift towards younger obituary photos. According to the authors, the creeping anti-ageism identified in the US study of obituary photos suggests from a genealogical perspective that society may be evolving the definition of a person’s peak year towards an age much younger than the year in which the person died. • When looking at an obituary photo, don't assume the image is a likeness of the person in their last years. This is particularly true if the person was at an advanced age. • Families of women are more likely than families of men to use younger obituary photos. • People tend to get professional portrait photos only at certain key milestones in their life: as a baby, upon graduation and when they marry. None of these is likely to qualify as an obituary photo. This means the photo used in the obituary was probably not taken by a professional photographer and so it is probably not worth the effort (in this case) to try to track down the photographer. • Many modern obituary photos have been cropped from larger images. It might be worthwhile trying to track down the original image since it could contain other family members. • Many modern obituary photos have also been cleaned up using photoshop. This can alter the likeness of a person. • Some families use the obituary photo as an opportunity to sum up a person's entire life in one image. As a result, it is always worthwhile looking at such images closely to infer more information about the person (their hobbies, interests, passions, etc. ).